The Mekuti Balance Dog Harness: stop your dog pulling on the lead. "My dog pulls on the lead, my shoulders ache. Walking my dog is hard work and I don't enjoy walks any more. 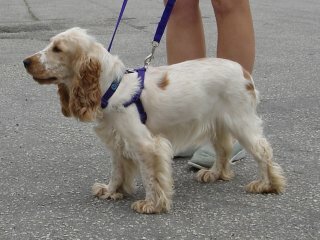 So, what can I do to stop my dog pulling on the lead?" These images were from a fitting for a very strong 'rescue' border terrier. The picture on the right was taken a few minutes after the one above. All the family, young and old, were able to walk with the dog without being dragged around. Sometimes it does take a bit longer which is why we give a 30 Day Guarantee. Pulling on the lead is an easy habit to get into and hard to break out of. 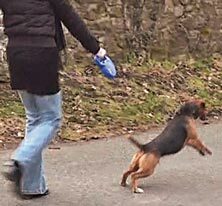 It can be caused by many things but often dogs pull when they are out of balance or when they're just excited! By using a Mekuti Balance Harness with a Double-Ended Lead, you can help to stop your dog pulling, gently and in a way which does not stress your dog. 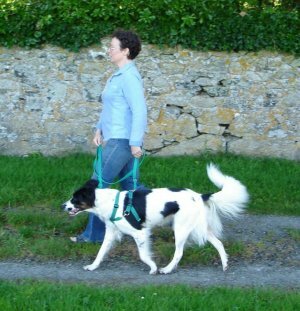 By using a double-ended lead attached in two places on the harness, you can help your dog to become aware of the way it is walking by bringing attention to its balance. 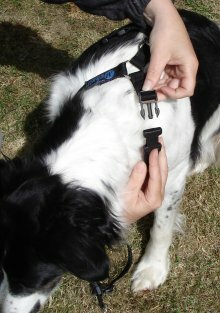 It is this awareness that helps you to use the Mekuti Balance Harness to stop your dog pulling. Full instructions are provided as well as email and telephone support. We're sure that soon, walking with your dog will stop being hard work and both of you will be able to enjoy your walks again — possibly for the first time! With our Money Back Guarantee you have 30 Days to try it out and see for yourself. If you are not happy, you can return it for a full refund. Will it suit my dog? All the straps are adjustable and this harness is comfortable for small, large and medium size dogs. 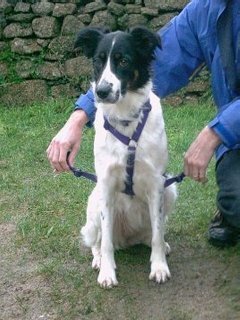 It can be used with all breeds, shapes, sizes and backgrounds: pedigree, crossbreeds and rescue dogs. Choose from a range of 7 great colours with co-ordinating Double-Ended Leads. 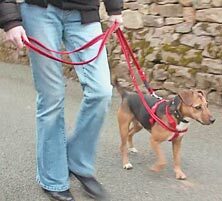 Prevent and stop your dog pulling on the lead without using force. Gently improve control, speed and direction. Reduce reactivity towards other dogs and traffic etc. Improves posture which can reduce back and shoulder problems in both the dog and the handler! Fully adjustable to make the perfect fit for any type or size of dog. It is comfortable for the dog and secure. Recommended by trainers to assist with general training and to stop pulling. The system does not replace your trainer — it helps them help you to train your dog. Promotes even muscle development which can help with a dog's recovery from injury or hip dysplasia. This page is where to buy the Mekuti Balance Harness and Lead together. The Small Harness webbing is 3/4" wide (19mm) and the Set comes with a 3/4" wide, 2.5 metre Double-Ended Lead, made from Softex and with one end with a small trigger hook but you can choose to have the longer 3m lead if you wish. (Note to puppy owners*: to get the more 'bite resistant' nylon harness, please choose Red or Black and tell us if your dog is under 18 months old when you checkout, but please note this harness IS NOT CHEW PROOF and can still be bitten through. The Medium Harness webbing is 3/4" wide (19mm) and the Set comes with a 3/4" wide, 2 metre Double-Ended Lead, made from Softex and with one end with a small trigger hook, with an option for choosing the LONG 3 metre version. NOTE: For 'heavier set' dogs measuring over 25" such as a Staffordshire Bull Terrier, GSD or Labrador crosses etc. you may wish to consider the Large size, as everything is 1" wide rather than 3/4" wide. Many customers have reported that the Large feels more comfortable and secure for them even though their dog could actually fit into a Medium. The Large Harness webbing is 1"wide (25mm) and the Set comes with a 1" wide, 2 metre Double-Ended Lead, made from Softex and with large trigger hooks on both ends, with an option for choosing the LONG 3 metre version. The Extra Large Harness webbing is 1"wide (25mm) and the Set comes with a 1" wide, 2 metre Double-Ended Lead, made from Softex and with large trigger hooks on both ends, with an option for choosing the LONG 3 metre version. See above for details on which style lead comes with which size. The Mekuti Balance Dog Harness Set comes with a Double-Ended Lead in a colour that goes with the harness. The Mekuti Double-Ended Leads that come with the Set are designed specifically to be used with the size of harness they relate to for comfort of the dog and the dog walker, as there are different lead lengths and widths for different size harnesse. Our standard Double-Ended Leads are made from SOFTEX: a padded material, which is really comfortable to use, doesn't get slippy in the rain and is strong enough to hold any dog. They can also be easily used as a regular lead by clipping one of the trigger hooks to one of the extra rings along the lead to make a loop handle of varying lengths. Many of our customers who have had sore hands or painful shoulders are delighted as to how reassuring these leads are to use. You can buy the harness by itself by clicking on this text if you already have a suitable double-ended lead. 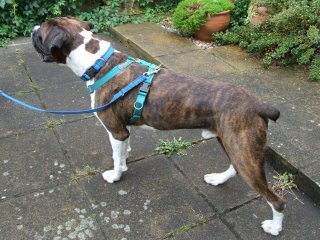 Small, Medium and Large Harnesses are vailable in 7 different colours. (See colours below) Mini Harnesses are available in Black or Red and the Extra Large Harnesses are only available in Black. 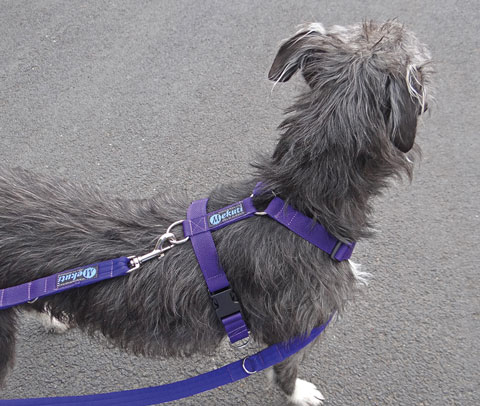 The Harnesses and Leads are made from different material so they 'Co-Ordinate' in colour rather than exactly 'Match'. Please also note that, for production reasons, the side clips may not always be the coordinating colour of the harness and may be black. If you have any questions about exactly what you will receive, please contact us and we will describe what exactly is currently available. 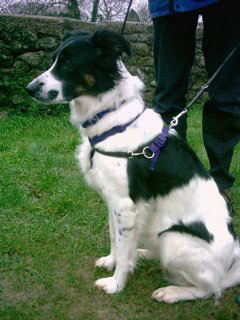 For instance, the purple harnesses may not always be available with purple clips (as shown in some of the pictures). Please note that colours shown are only an indication. The Dog Harness comes in five sizes (all are adjustable within the size range). The Mekuti Balance Harness is FulLY ADJUStable within the size range you choose for your dog. It can be adjusted on the Neck Straps, the Chest Strap and the Barrel Straps around the ribs to make the perfect fit for any breed, type, size or shape of dog. 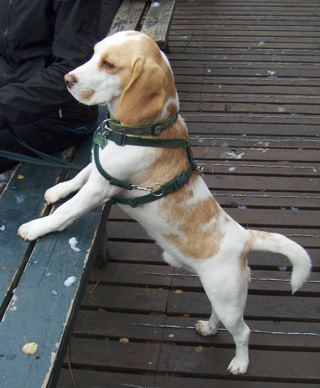 Generally, pick the harness with the measurement closest to the middle of the size range but you may have to make allowances if your dog is still growing as a puppy, thick set or slight in build. This is especially the case when choosing between the Medium or Large sizes if your dog's rib measurement is 28 inches, for instance, which would fit both. Note also that in the large size 1" webbing and Softex materials is used for the harness and lead, as opposed to the 3/4" in the medium harness and lead. Measure in all the way around the ribs behind the front legs. Assistance with helping your dog's even muscle development, particularly if hip displasia is an issue. Improved control, allowing both you and your dog the opportunity to enjoy your time together, with no shouting! 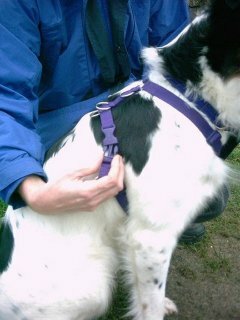 Nervous dogs - the harness is designed to be put on without having to lift the legs, or manhandle them in anyway, so it's very useful for rescue dogs. Dog or people-aggressive dogs can be led safely between 2 people, being attached to both by a lead to add to their confidence and help them to cope in these situations. TAKE SPECIAL CARE IF YOU WALK YOUR DOG NEAR THE SEA. Salt will corrode and damage the rings and may cause untimely wear to the webbing as well and will invalidate the guarantee, so it is very important to rinse off any salt water and make sure there is no sand left on the harness. Occasionally, put the harness and lead inside an old pillowcase and wash at 40° C with your usual wash. Dry in the air, not a tumble drier. Keeping the harness clean will prolong its life and make it more comfortable for your dog. Check your harness regularly for signs of wear. Any damage to the webbing or stitching will weaken it. Dogs learn very quickly. When a dog pulls on the lead a few times & realises that you follow it quickly becomes a habit. All the shouting and pulling on the dogs neck will do little to stop the behaviour, possibly making it worse and more importantly possibly cause damage to your beloved companion. Check chains can also remove the dogs coat from around the neck and cause pinch injuries leading to hypersensitivity in the neck area. Badly used head halters can result in whip-lash type injuries ( which is why it is recommended that they are only used with a double-ended lead to also attach to the collar as a preventative measure). Any dog leaning into their collar will have a reduced oxygen supply to their brains, thus making it difficult for them to think clearly, or even rationally. 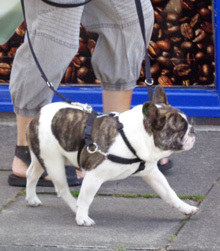 A dog that pulls on the lead is more likely to react badly when they see other dogs or people. The patent pending Mekuti Balance Dog Harness is made from webbing, with multiple attachment points to give you options on where the points of contact are to be. It comes in 5 sizes, each being fully adjustable behind and in front of the legs, and underneath the chest. This ensures a close, comfortable fit that doesn't pinch or rub. The seams are external on the chest for more sensitive dogs. 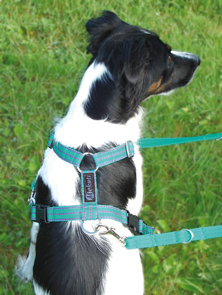 The Mekuti Balance Dog Harness TM enables the handler to use two points of contact with the dog. When a dog pulls, you become part of their balancing technique. By using two connection points, you can withdraw one of the balance points before taking up the other. It is very simple. The end result is a dog that is unsure what he can lean into and therefore re-learns how to balance on his own four feet without relying on you - hence "Balance Harness". Once the dog has learnt this, you give fewer and fewer signals until he is walking alongside you without your input. Is a pleasure for its handler. 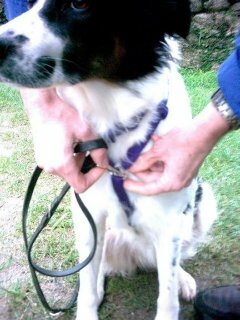 Undo the two clips and place the harness over the dogs head. Re-attach the clips on either side of the chest. Attach one end of the double-ended lead (with the largest clip) to the D-Ring on the back of the harness. Then thread the other smaller clip down through the chest ring at the front. Attach the lead to the ring on the side of the harness and you are ready to start.